This week, the latest from Fukushima, how the West views the New Chechnya and reelected Nursultan Nazarbayev. Ekaterina Kudashkina: This week we will first turn to Japan, where the situation at the crippled Fukushima nuclear plant is still balancing on the verge of ecological disaster. We will then look into a Washington Post story about Chechnya and its leader Ramzan Kadyrov, and finally we will move on to Central Asia to examine the phenomenon of an “old guard” national leader –President of Kazakhstan Nursultan Nazarbaev. In our first heading, Beyond The Headlines, despite the efforts of the emergency team of some 500 workers, the Fukushima nuclear plant remains a very serious problem. The plant is running out of storage capacity for all the highly contaminated water that had been used to cool the reactors and this prompted Fukushima plant operator Tokyo Electric Power Company to authorize a release into the ocean of 11,500 tons of the less-contaminated water. So, this looks like a new stage of the Japanese crisis threatening not only the Japanese. Sergei Strokan: I understand that the ocean is very big, but psychologically, it is very difficult to ignore or bypass this fact. Ekaterina Kudashkina: I have spoken to some experts, and they told me that fear is an extremely powerful factor in the whole situation. In my opinion, fear and anxiety come from disbelief, and disbelief, from a lack of information. The Japanese authorities insist that they are acting in full compliance with international law and that their move [to release radioactive water into the ocean] poses no danger for human life. But I know many who have their doubts. According to VTsIOM, only 19 percent of Russians believe Japanese authorities are telling the truth and 69 percent say that authorities don’t release all the information available to them. Sergei Strokan: This is not some sort of specific Russian skepticism. I have also seen reports saying that Greenpeace’s German representative has already acknowledged the seawater close to Fukushima being strongly contaminated. Ekaterina Kudashkina: As far as I understand the Japanese have also acknowledged the fact. Sergei Antipov, Deputy Director of the Institute of Safe Nuclear Energy Development with the Russian Academy of Sciences, recently told me that depending on the concentration of radioactive nuclides in the liquid, liquids are split into three categories: High radioactivity means that a person cannot come into contact with the liquid. Medium radioactivity requires complex treatment technologies, whereas low radioactive liquids are more or less subject to treatment and purification. That is some consolation. A lot depends on how the situation is going to develop in Japan. Sergei Strokan: There are many truly moving stories that reveal telling aspects of Japan. I am now convinced that Japan is a truly unique society. Mira Salganik: I do not know if it can be called unique. The Japanese are known for their efficiency, but what we are observing now is much more than that. It seems to be a very deep cohesion in Japanese society. went to Japan shortly after the catastrophe hit. Marc Francetti: I was in Japan a few days after the earthquake and the tsunami, I was first in Tokyo, and then I went up north, and traveled by car down the coast visiting the villages that were most hard hit by the tsunami. I actually didn’t go down to Fukushima, because one of my colleagues was concentrated on the nuclear story. I was more interested to do a story about the villages that were hit by the tsunami and to talk to survivors. So I drove down the northeastern coast, which is the same coast as Fukushima. I have never been to Japan before, but I have covered grief for more than 15 years—in the Caucasus, in Iraq, Afghanistan, Kosovo—and it was just very surprising to me how the Japanese deal with grief, which is completely different from what I have known before. I was with a man at the moment when he found his dead wife under the rubble of his house. You would never have known. I turned to the translator after and said I was amazed by how little emotion he showed, and she looked at me as if I was from a different planet and said: “What do you mean, couldn’t you see that he was very, very tense?” And I had this time and again, it is not that they do not suffer and they do not grieve, of course they do, it is just they have a very different way from us of expressing it, they very much try not to show it, they are very stoical, very, very strong. I was very impressed by how stoical and calm and organized, I didn’t see one single incident of looting. Just the way they were dealing with the biggest catastrophe since the end of the Second World War was very impressive. Up in the north, the thing that was interesting to me was that the destruction was just extraordinary. When you look at the destruction and you look at the figures of the dead, which should probably be around 20,000, you understand that in another country, it would have been at least ten times more. The reason is that the Japanese are actually very well trained and very well organized; it is part of their subconscious. In the few days I was been there I had the impression it has had a terrible impact of the national psyche, it is going to be the most expensive natural catastrophe in the history of the world, but I think if there is a country that can’t bound back it is certainly Japan. They just have a different way of dealing with situations like this. Ekaterina Kudashkina: Is international aid coming in? Marc Francetti: There is aid coming in; when I was there, there were American helicopters that were landing in some of the villages and giving aid but the aid was quite slow in getting to some places. I would say that the reaction in terms of speed of the rescue probably could have been faster, but it has to be said that some of these places are quite remote. Ekaterina Kudashkina: From what I am reading from news wires, I get an impression that while the whole situation in Fukushima is so serious, something like radiophobia is less frequent in Japan than in neighboring countries. Marc Francetti: Well, the levels were still lower than what is considered risky for your health. The Japanese are taking it seriously and there is alarm about it. But the reason there is so much alarm is because it is an invisible threat; we as ordinary people know so little about. This is something very scary about radiation, because we do not understand it, and it is difficult to know to what extent the Japanese government is being open, has been competent, and it is just one of the things that are just particularly scary, especially to ordinary people who know nothing about it. Sergei Strokan: Well, let us talk politics. It is quite clear that Prime Minister Naoto Kan is acting now like a crisis manger. The man is under enormous pressure and just days before the quake, the Japanese government led by him was on the verge of collapse. This week the leading opposition force, the Liberal-Democratic Party, announced that due to the extraordinary situation in the country, it is going to drop its previous demand to dissolve the parliament and hold early elections.To me, this shows that the political elite is able to generate national consensus, putting aside narrow political interests. Ekaterina Kudashkina: And now we are moving on to Red Line’s second heading Between the Lines, in which we consider one of the most notable newspaper stories of the week. This time it is going to be a story entitled “In Chechnya, apprehensions over a roughshod leader” published by the Washington Post and written by its Moscow-based correspondent Kathy Lally. Sergei Strokan: For nearly two decades, Chechnya remained the bone of contention between Russia and the West. The Chechen issue has been generating lots of tension in Russia’s relations with a whole number of other countries. However, now the situation has changed drastically: Chechnya is no longer at war with Russia, its president Ramzan Kadyrov misses no chance to proclaim his loyalty to Moscow and Moscow doesn’t interfere in his domestic policy. Not publicly, at any rate. The question is – does this arrangement really work and is Moscow satisfied with it? Mira Salganik: This Tuesday, Apr. 5, Ramzan Kadyrov had his second inauguration. For the next five years he will be the head of Chechnya – not the president, because last year Kadyrov made a formal proposal that regional leaders should not call themselves presidents, as there is only one president in Russia, as he put it. Sergei Strokan: This is not a question only of rubble, but of ruble. Why not? Chechnya’s rehabilitation programs’ funding comes from the Federal budget. It is reported that it is responsible for over 80 percent of the Chechen budget. Yet, so far there are not many reports of sustained economic development in Chechnya. Ekaterina Kudashkina: I can see the logic of sending money to Chechnya in what can be seen as an attempt to secure peace and stability in a highly volatile security situation across the whole of the North Caucasus’ region. Now let me quote the story: “Kadyrov runs the Muslim region as his personal fiefdom. Establishing the veneer of a separate Islamic state, Kadyrov orders women to wear headscarves, encourages polygamy, and observes elements of sharia law, all in violation of Russian law and contrary to more liberal Chechen tradition.” Isn’t it a violation of the Russian Constitution, though? Mira Salganik: Of course it is. I am friends with a Chechen family in Moscow. They are two sisters, refugees from Grozny, working as seamstresses here, working hard and making decent living. A while ago they told me they wanted to return to Grozny. Much to my surprise, they were back in a couple of months! They told me, that although they were good Muslims, they could not adjust to the stringency of behavior demanded of women in Grozny and the dress code imposed by Kadyrov. Ekaterina Kudashkina: What kind of Islam is there in Chechnya? Mira Salganik: There are Sunnis, but the Sufi orders are rather strong there. Apart from sharia law, there is another thing that shapes the behavior of Muslims. This is adat. If sharia is the law, adat is the code of customs in mountainous areas, among the nomads. This code of customs is stronger than sharia and less stringent. Ekaterina Kudashkina: What is interesting, what is striking a little bit in Chechnya, as you say, there are the Sunnis, but the stringent dress code reminds me of Saudi Arabia, who are also Sunnis, but they are Wahhabis. Mira Salganik: As to the stringency of behavior, dress code etc, it is lighter as I told you in tribal nomadic societies and societies living in different nature conditions, for daily existence reasons, as for the stringency, I mean Sunnis and Shiites could be equally stringent on it, but Sufi orders are less, they put more emphasize on spiritual development of the person. Sergei Strokan: To me the principal idea of Ms. Lally’s story is that Moscow, having finally realized that it cannot control Chechnya, was forced to cede the authority to Ramzan Kadyrov. According to the author, Kadyrov now holds the Russian leadership hostage. “Outsourcing sovereignty,” to quote the story. This is what I cannot subscribe to. While not questioning Russia’s sovereignty and territorial integrity, Kadyrov wants to secure a place of honor under the Islamic sun, to build a reputation in rich lands of Islam. Well, this is quite a pragmatic approach, as people with deep pockets from Islamic states and not necessarily Muslim radicals can come with their money to the republic. This can boost the sustained economic development of Chechnya. Mira Salganik: I think the logic was slightly different. Ramzan Kadyrov does want to establish deep relations with neighboring Muslim countries, but at the same time, as you put it, Kadyrov is positioning himself as warrior fighting for Russia’s territorial integrity. This is what he says: “Russia gave us the mission to destroy terrorism and extinguish it in the North Caucasus, and results have already been achieved.” Some results, I’d say. I would like to mention another thing. As far as I know, Chechnya still remains a society of family clans, with old feuds between various clans still going on. So, there is more about the two wars than meets the eye. Sergei Strokan: The Washington Post story also quotes Russian expert Sergei Markedonov as saying that Chechen leader “Ramzan Kadyrov has created a state within a state,’’ and that “he holds the Russian leadership hostage” Well, I know Sergei Markedonov personally, and I highly respect his opinion, but I think this time he missed the point. The changes in the republic come quite quickly, so some analysts just can’t cope with the pace of change. Ekaterina Kudashkina: Why don’t we call Sergei Markedonov himself, who is currently a visiting fellow at the Washington-based Center for Strategic and International Studies. Sergei Markedonov: First of all, in my mind, this issue is not a subject of belief. What did I mean about Moscow being the hostage of Grozny? First of all, Ramzan Kadyrov is the only politician in Russia who can criticize the Kremlin or the special services of Russia. Let us look at the religious policy of Ramzan Kadyrov. It is a direct intervention of religion in a secular government. It contradicts with the Russian Constitution, but at the same time it is kept in Chechnya. But Ramzan Kadyrov himself is not targeted for criticism from Moscow, and this is a unique case. Kadyrov is an untouchable person in the Russian Federation. Maybe if we rely on the number of restored buildings or new schools, or maybe square kilometers of renovated areas, maybe we could register great improvement, great progress in the situation in the republic during Ramzan Kadyrov’s reign. If we use other criteria, for example, number of terrorist attacks, I am not sure that those facts will prove that the situation in the reign of Ramzan Kadyrov has improved. Ekaterina Kudashkina: A complicated issue like this gives rise to lots of heated debates. For an alternative opinion, I suggest turn to a leading Russian writer on Chechnya, political analyst with Kommersant Musa Muradov, who is a native Chechen and is personally acquainted with Ramzan Kadyrov. Musa Muradov: Unfortunately, not only western analysts but some of my Russian colleagues tend to refer to this myth, saying that Moscow has been taken captive by Grozny with Ramzan Kadyrov dictating his will to the Kremlin. But that’s not the case actually. In my view, Kadyrov as the Chechen leader is by no means going beyond Russia’s legal framework, making arguments that Moscow is on bad terms with the Chechen leadership ridiculous. Indeed, we can speak about some immense support and tremendous attention to the latter from Moscow, but there is a simple explanation for this. In view of two military campaigns that took place in the republic, there are certainly some economic and other benefits that the Chechen government and President Kadyrov effectively use. The Chechen leader has his own strong leadership skills, but at the same time, his power and authority come from the Kremlin’s support. Without this support he would have hardly managed to implement many of the country’s successful projects, especially those aimed at restoring Chechnya. Unlike his colleagues from other republics, Ramzan Kadyrov has significant influence on all the republic’s structures, including federal security agencies. They do not report to him formally but he influences them and uses this to combat crime and armed underground gangs. And he is very good at that. A leader of any North Caucasus republic, if asked why he did not provide an adequate response to an incident as a result of poor interaction with security agencies, would answer that they do not subordinate to him. You will never hear Ramzan Kadyrov say that. Yes, formally they do not follow his orders, but he considers himself responsible for their actions. Arguments concerning his getting out from under the Kremlin’s control are simply untrue. Ekaterina Kudashkina: Now we turn to Red Line’s final heading, Man In The News. This week the man is going to be Nursultan Nazarbayev – the new and the old president of Kazakhstan. After 20 years at the helm of the country, on Apr. 3 he enjoyed another landslide victory and another seven-year presidential term. 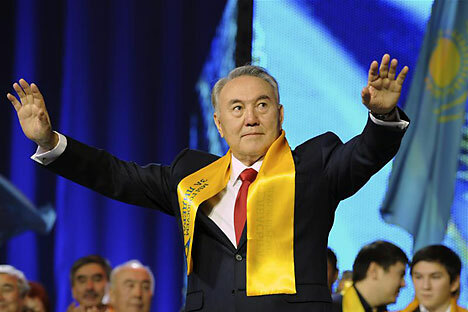 Mira Salganik: For Nazarbayev, his only competitor for years and decades remains himself. In this year’s election, Nazarbayev managed to beat his own record from the 2005 presidential race. Six years ago he won 91.2 percent of the vote and today it is an incredible 95.5. Ekaterina Kudashkina: I know it might seem to be a little far-fetched, but at a time when Middle East revolutions are dismissing decades-old regimes one after another, don’t traditional, old-style Kazakh politics seem rather outdated? Sergei Strokan: Yes and no. Kazakh authorities argue that the situation in the republic has nothing to do with the Middle East upheaval and all parallels, if any, look irrelevant. "We are an open society and a democratic one," insists Nazarbayev. Indeed, he doesn’t fit the image of a regular oriental despot or autocrat, ruling his country with iron fist and tolerating no dissent. Just a few facts: Despite the global financial crisis in 2009, economic reforms initiated by Nazarbayev have ensured 8.5 percent annual growth in the country. It is also true that compared to other former Soviet republics, the country has become one of the hottest markets for foreign investors. Last December, Standard & Poors upgraded Kazakhstan’s rating. Mira Salganik: And the unemployment rate in a country of 16.4 million is on decrease and there are no visible signs of ethnic discrimination, social tension or public discontent. Ekaterina Kudashkina: Still, some might wonder if a system in which a president remains in place for more than a decade is good for political development of a nation, particularly when this nation’s independence is barely two decades old? Sergei Strokan: I think that two decades after the collapse of the Soviet Union, Kazakhs are lucky to find themselves in a much better position than their former compatriots from other ex-Soviet republics. Ekaterina Kudashkina: However, some analysts point to the lack of real opposition in Kazakhstan, which, though many see it as an indication of president’s strength, can one day turn into a weak point. Sergei Strokan: While a seemingly quite well-to-do state, Kazakhstan is far from being a paradise. Nazarbayev’s rule is marred by corruption scandals involving people from the high echelon; power is consolidated in the hands of his inner circle – relatives and friends. And while president Nazarbayev is calling Kazakh society “open and democratic,” human rights activists report human rights violations and speak of curtailment of democratic freedoms. Mira Salganik: The biggest problem of Nazarbayev, as I see it, is that there seems to be no one who might be regarded as his potential successor. Ekaterina Kudashkina: But if you remember the situation in Syria some 25 years ago: The father of the present leader was not a despot, but he was quite an authoritarian. However, he still manage to breed a successor, his own son, who is not the worst of possible leaders. Mira Salganik: You can’t really preclude the opportunity for Nazarbayev’s son or daughter, but we do not know yet. If you compare Kazakhstan to all the former Soviet Central Asian republics, Kazakhstan is doing better. Ekaterina Kudashkina: But is it due to its peculiar model or is it due to its leader? Mira Salganik: The personality of the leader constructed sort of a model. Nazarbayev’s success looks convincing. I spoke to several people who are Russians and who left Kazakhstan several years ago. They are not particular sorry, but if they were there now, they wouldn’t have moved. In the increasingly interdependent globalized world changes come faster than expected. But let us hear from our expert. Now we are joined by Vadim Kozyulin, a research fellow with the Moscow-based PIR Center. Vadim Kozyulin: First of all I guess we should remember that Kazakhstan is a relatively new government, and we should remember that this is a rather new and rich country, they have a lot of oil and gas deposits and other mineral resources, so that is what differentiates Kazakhstan from Arab countries. They a long history of autocracy, but although Kazakhstan is also an autocratic country, it can be treated as a story of success. People in Kazakhstan feel that they witnessed a lot of changes and their success is connected with the name of Nazarbayev. If you visit Kazakhstan ,you will see that on the one hand it is quite an European country, people there think in an European way, they construct European buildings, they conduct business in an European way, on the other hand they are quite oriental in their mentality; they like to expose their richness, they like to construct expensive houses, and buy new expensive cars; social stratification is very obvious when you are there. I think there is one important thing that distinguishes Kazakhstan from the Middle East: In the Middle East there is no atmosphere hope for the future. New generations of people see that they have no jobs, no money and they have no prospects for the future; that’s why feel they need changes. For Kazakhstan it is quite different. This is a rich country with few inhabitants, and these inhabitants have a record of getting richer, they getting educated, many people from neighboring countries come to Kazakhstan to get jobs and they connect their future with Kazakhstan. I feel that people trust President Nazarbayev—not just from his nation, but from neighboring countries as well, Kazakhstan is viewed by neighboring counties as a prosperous regional state. I would draw your attention to two names surrounding Nazarbayev. The first is his son-in-law,Timur Kulibayev, the husband of Nazarbayev’s daughter, Dariga. He is a rather young man, very ambitious, and I would say aggressive in business, he concentrated all the economic power of Kazakhstan in his hands. It is obvious that he has certain ambitions in the political field and there are many articles written about him where he is depicted not only as economic but also as a political figure who might influence certain processes not only in Kazakhstan but in other countries as well, he is engaging in international negotiations on different levels, but he is not a public figure. A more public figure is Imangali Tasmagambetov, he is a former prime minister and he used to be a mayor of two Kazakhstan’s capitals, Astana and Almaty. He is well known and very popular among the population and he is a very close friend of Kulibayev. So what do certain observers expect? Kulibayev might be interested to inherit the power from Nazarbayev, but he might do it not directly, he might transfer the power to Tasmagambetov and he will be the real governor of the state, while Tasmagambetov will be the official ruler of this country. Some observers say that there is evidence that President Nazarbayev is tired of being the number one man and his health is not so good as it used to be. Some observers say that there is a probability that Nazarbayev will convey his power before the next election the way our President Yeltsin conveyed it to Mr. Putin.